Can "Heads Up" Tackling Fix Football's Concussion Problem? New concussion research suggest techniques offer some improvement. As soon as the center snaps the ball to the quarterback, football fans hear a familiar sound: the crash of helmets. It’s a sound so visceral in its intimate intensity that it feels woven into the fiber of the game. But it’s also the cause of short-term and long-term health problems for many athletes, especially in high school. A 2007 study found that sports are among the leading causes of traumatic brain injuries in people aged 15 to 24, second only to motor vehicle crashes. Football and soccer are the sports whose athletes experience the most concussions, and among football players, high schoolers are almost twice as likely as college players to experience concussions. Concerned parents, coaches, and scientists have proposed many solutions, including nature-inspired helmets and rule changes. And according to researchers, some of these efforts may be working. In a study published Friday in the American Journal of Sports Medicine, a group of South Carolina doctors and school officials found that improved education on tackling techniques led to a significant reduction in concussions among the high school football players in Greenville, South Carolina. The researchers tracked 2,514 student athletes during the 2015 season. About three-quarters of the coaches received training in Heads Up tackling, a program designed by the group USA Football to help coaches decrease injuries. Among the 1,818 athletes playing under coaches who received Heads Up training, there were 75 reported concussions during the season. From the 696 athletes who were coached under traditional routines, 42 concussions were reported. This translates to 4.1 concussions per 100 players in the Heads Up group versus 6 concussions per 100 players in the non-Heads Up group. The researchers seem encouraged by these results. In addition to reduced instances of concussions, the researchers reported that Heads Up players returned from injuries 27 percent sooner than non-Heads Up players. National debate has raged over the issue of concussions in football. The NFL long disputed whether concussions cause long-term problems like chronic traumatic encephalopathy (CTE), a neurodegenerative disease that might only surface after a player retires. In 2016, long after science had rendered the clear verdict, the NFL finally admitted there is a connection. It’s not just professional football’s governing body that’s hindered public discussion of concussions in football, though. The culture of football makes statistics hard to trust, with some calling into question whether athletes will report their injuries. This research is just one piece of the puzzle. And with these positive results, this study could serve to vindicate Heads Up, which came under fire for misrepresenting statistics in 2016. 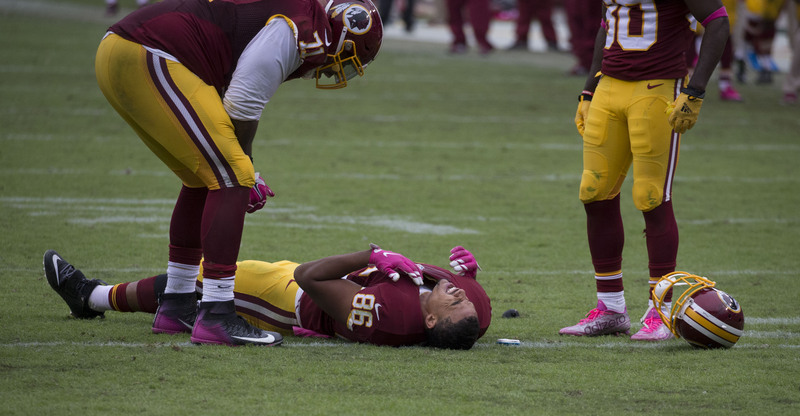 It’s hard to say, though, whether these modest improvements in injury rates can secure the future of the game as players like Jordan Reed talk publicly about their doubts. But at least, with programs like Heads Up facing scientific scrutiny, the discussion is advancing. Abstract: Objectives: Concern over participation in football has grown over the past decade in part due to the risk of head injury. In response, the National Football League (NFL) teamed up with USA football to develop an educational training program, the heads up (HU) program, designed to teach proper preventative blocking and tackling techniques. The seasonal risk for concussion has been estimated at approximately 10% in high school football players. Adolescent football players were estimated to have the greatest frequency of 1-year risk when compared to youth and collegiate players. These findings combined with the concern over subconcussive impacts highlights the need for prevention programs emphasizing a reduction in head impacts during player contact. The purpose of this study was to prospectively compare cumulative concussion rates between high school players on heads up (HU) trained football teams versus teams that did not institute heads up (NHU) football training. Methods: We monitored 2,514 high school football players during the 2015 competitive football season in the Upstate of South Carolina. Prior to the start of pre season football, at least one coach from 14 schools (n=1818 participating athletes) received heads up training from USA football. The HU trained schools were matched with a 10 schools (n=696 participating athletes) performing standard training and football practice. Random monitoring for proper coaching technique and instruction was performed at 3 time points during the season at each trained high school to ensure compliance with program guidelines. Therefore, 1,818 high school players participated in practices and games under the direction of a heads up trained coaches and 696 athletes participated without the benefit of heads up training. Athletic trainers at each school monitored and recorded injury information for all practices and games from the beginning of practice to the end of the playoffs for all schools. Cumulative incidence and incidence rate ratios of concussions were calculated with 95% confidence intervals to determine program effectiveness. Results: We observed 117 concussion injuries. Players on the HU training teams sustained 75 concussions compared with 42 concussions on NHU teams. The HU rate of 4.1 concussions/100 players (95% CI =3.3-5.1) was significantly lower than the 6.0 concussion rate on NHU teams (RR= 1.5; 95% CI= 1.1-2.1). The HU football group resolved their concussions and returned to full participation 27% faster than athletes in the NHU football group (time-loss: 18.2 ± 10.6 days (95% CI= 15.8-20.6) vs. 24.8± 15.3 days (95% CI= 19.9-29.7) respectively). Conclusion: This is the first paper to evaluate the impact of the training program on the incidence and recovery of concussion in high school football players. Our results support the use of USA football heads up training as an effective method to decrease the rate of concussions in high school football. The program also appears to reduce the concussion severity in these athletes.